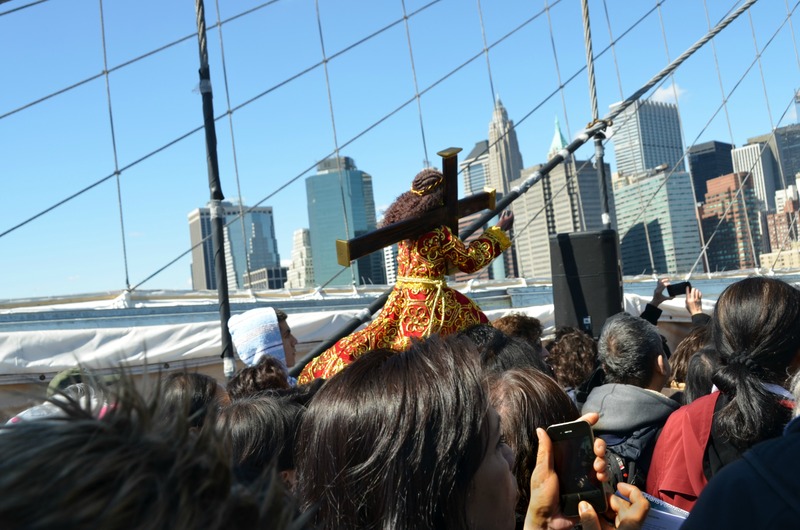 JESUS ‘CROSSES’ THE BROOKLYN BRIDGE: (Re-post from Good Friday 2013) I was conducting a walking tour across the Brooklyn Bridge this Good Friday and wondered why I was hearing this mass amount of voices singing up ahead of us. When we got to the center of the bridge there was Jesus and his followers crossing the bridge. Hundreds of people recalled the suffering and death of Jesus with a procession over the bridge in observance of Good Friday. Called The Way of the Cross, the traditional Catholic pilgrimage began at St. James Cathedral in Downtown Brooklyn where Bishop Nicholas DiMarzio presided over a short service. Observers then spilled out of the church doors to follow the Rev. Richard Veras, who carried a large wooden cross over the bridge. The Way of the Cross procession in Brooklyn began in 1996 with a small group of friends. Participants visit five symbolic stations of the cross at St. James Cathedral, a point on the Brooklyn Bridge, City Hall Park, Ground Zero, and finally ending at St. Peter’s Church on Barclay Street in Manhattan. This entry was posted on April 18, 2014 by newyorkcityinthewitofaneye. It was filed under DAILY PHOTOS WITH STORIES OF NEW YORK CITY and was tagged with bishop nicholas dimarzio, Brooklyn, Brooklyn Bridge, city hall park, Good Friday, Ground Zero, Hans Von Rittern, Jesus Christ, Manhattan, Manhattan skyline, New York City, New York photo, Photo of the day, photography, St. James Cathedral, St. Peter's Church, The Way of the Cross, tourists.